Karen is a Marie Curie Postdoctoral Fellow working in conjunction with our BME group and Dr Chris Creevey’s group at the University of Aberystwyth. Her PhD studies were on phylogenetics, algorithm design and comparative genomics at NUIM, Ireland. Before that she completed her PhD in Peru studying specific frog species of the amazon. 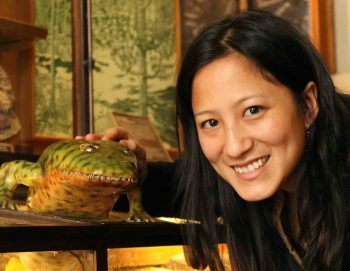 Her Postdoctoral work is on the very charismatic group of frogs commonly known as the Poison Arrow or Poison Dart Frogs. Karen’s work combines field work, molecular biology, genomics and bioinformatics skills. Her postdoctoral studies are on the evolution of these species and their unique toxin producing abilities at the molecular level using transcriptomic, genomic and proteomic data analytics. Transcriptomic and metagenomic analyses in amphibians. Large-scale phylogenetics, evolution and taxonomy of amphibians. Assessing cryptic amphibian species using barcoding techniques. Diversity and conservation status of Peruvian amphibians and reptiles. Office: Room 2.30, Edward Llwyd Building, Penglais Campus.